Have files you wish to keep out of sight? Ever wanted to keep credit card details convenient to access and safe on your Mac? 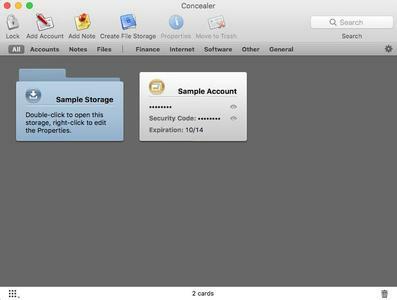 Concealer helps by keeping files and confidential information secure, out of sight, and organized, right on your Mac. This reliable encryption software stores information in the form of cards and uses industry-standard methods of data encryption (AES-256) to protect information such as credit card numbers, website passwords, software license codes, confidential files and photos, and much more. Three types of cards (Accounts, Notes, File Storages). Data kept secure using 256-bit AES encryption. Password Assistant that generates passwords. Drag and drop files and text to cards. Customizable categories for easy filtration. 60 icons and the ability to use custom icons. Text notes for each card. Ability to relocate and switch between repositories. Export cards to text files. Six predefined templates (Bank Account, Credit Card, Email Account, Software Registration, Web Site, Miscellaneous). Mask certain fields in the main window. The ability to copy multiple fields to the Clipboard. Use the master password or assign a separate one to each file storage.